Melbourne arguably has the most competitive sport market in Australia, if not the world. In addition to other sporting codes, the city is home to nine AFL clubs and another just down the road in Geelong. As such, every professional sport club in the city faces an uphill battle in gaining supporters and an even tougher challenge in convincing those supporters to sign up as members. Membership sales are crucial for AFL clubs. As well as generating the majority of a club’s revenue, memberships allow supporters to shape a club, electing the board members responsible for future decisions. Success is the obvious and easy way to sell memberships, as displayed by Hawthorn and Collingwood who have both won premierships in the last five years and have each topped 70,000 members this year. Enjoying on-field success, though, is much easier said than done. Most clubs are left to find other ways to drive membership sales and establish a strong emotional connection between supporters and their club. 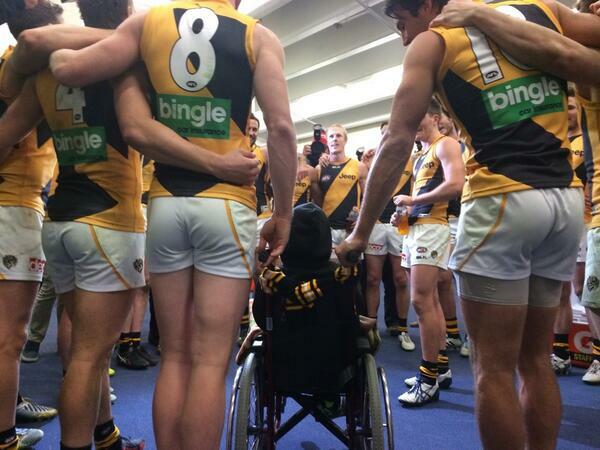 Unquestionably, the best at this in the AFL is Richmond. Despite having little success lately and having not won a premiership since 1980, the Tigers have more than 68,000 members for 2015 and the third most of any AFL club after Hawthorn and Collingwood. “We’re very lucky that whilst on-field hasn’t been going well for a long period, we’ve got a very loyal, strong, passionate supporter base,” Alex Jolley, Membership Manager at Richmond, tells upstart. The number of signed up members to date–68,446 as it stands–is testament to both the loyalty of Richmond supporters and the club’s marketing department for managing to keep long-term members engaged and recruiting new ones. A key aspect in keeping members and supporters engaged through tough times as well as the good is through digital multimedia content. Richmond leads the way in this respect, offering an official club podcast and regular video content on its website. “It is really engaging. Whether people are members and they consume it regularly or whether they’re just fans who consume it regularly it does help build that connection,” Jolley says. “It hopefully gets people who aren’t currently members but might consume videos every day or once a week in twelve months time to have built up that connection and sign up as a member. Richmond also prides itself on giving back to the community, whether it be through the partnership with The Alannah and Madeline Foundation or welcoming terminally ill supporter Nate Anderson into the fold in 2014. “While we exist to win premierships, we’re certainly out there to use the position that we’re in to enhance other areas of people’s lives,” Jolley says. Despite the excellent work the club is doing off the field, when it comes to the primary business of a football club–winning premierships–Richmond has been a failure for 35 years. It is through the constant failures and disappointments, however, that the unique characteristics of Richmond supporters have been able to develop and flourish. They are at once optimistic and pessimistic, maintaining the belief that the elusive next premiership is just around the corner while simultaneously being wary of yet another false dawn, of which the club has seen many. The Tigers generate more on-field drama than perhaps any other in that nothing is done the easy way. Their nine-game winning streak in the last nine rounds of 2014 to clinch eighth spot and a finals berth after a dismal start to the year exemplified this. The, at times, unbelievable string of wins captured fans’ imagination before ending in disappointment in the form of a 57-point elimination final loss to Port Adelaide. In other words, a string of games that was quintessentially Richmond. The sense of impending drama that hangs over the club draws people to it. It provides an emotional rollercoaster, making the good times even sweeter and strengthening the connection between supporter and club. We’ve all heard the jokes and seen the footage of Richmond memberships in the microwave but, for the most part, Richmond supporters remain loyal and proud despite having 35 years’ worth of reasons not to be.